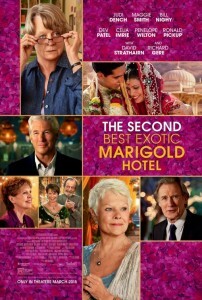 After the surprise success of the delightful 2012 film, The Best Exotic Marigold Hotel, it is no wonder that director John Madden decided to do a companion film and organize a more extravagant and blissful reunion of the cast of the first film with newcomers Richard Gere, no longer the Gigolo, and David Strathairn to make up the male parts for the Second Best Exotic Marigold Hotel set in Jaipur, Mumbai and San Diego. Whilst the original film was a sort of bitter-sweet adventure, the second film is a celebration and continuation of everything so wonderful and colourful about the possibility of spending one’s Twilight years in the exotic location of Jaipur. This is Shady Pines with colour and vibrancy, wit and humour and proves that the older generation of actors can still pull off a charming and marvellous sequel infused with the energetic Sonny wonderfully played again by Dev Patel (Slumdog Millionaire) and his impending wedding to Sunaina played by Tina Desai. In The Second Best Exotic Marigold Hotel, Sonny has big plans for expansion and hopes to acquire another rambling hotel in Jaipur to extend his collection of gorgeous establishments for the aged and semi-retired. The scenes between Patel and veteran actress Maggie Smith are crackling with wit and exuberance especially as they approach a major hotel chain based in San Diego for some much needed venture capital to expand their business enterprise. Back in India, director John Madden expands his palette from the first film and each shot of The Second Best Marigold Hotel is a simulacrum of all the great films made about that subcontinent from David Lean’s A Passage to India and Mira Nair’s Monsoon Wedding making for a positively blissful and gorgeous cinematic reunion. Subtly directed and beautifully acted, although the story is at times whimsical, each of the British actors from Celia Imrie and Diana Hardcastle to Ronald Pickup and Bill Nighy have more scope and depth in this companion piece which will surely delight all audiences who so enjoyed The Best Exotic Marigold Hotel. Silver haired Richard Gere’s role as an enigmatic guest Guy Chambers and seducer of Sonny’s mom add to the romance of the Jaipur establishment. The structure of the film is centred around the marriage of Sonny and Sunaina from the lavish engagement party to the actual flamboyant and vibrant wedding. Intertwined with the portrait of young love, is the growing affection between Evelyn and Douglas played with the usual quirkiness by Bill Nighy. The scenes between Dench and Smith are poignant and nuanced, both Oscar winning accomplished actresses as they give viewers a sense that their imminent cinematic retirement is drawing near, yet their stardom will last forever. Oscar winners Maggie Smith and Judi Dench have had amazing stage and screen careers and it is encouraging to see them still commanding the big screen in an age of the digital blockbuster. Whilst The Second Best Exotic Marigold Hotel is not as brilliant or as unique as the first film, it still stands on its own as a delightfully fine companion piece. Judging how packed the cinema was, there is a huge market out there for these gorgeous films aimed at retired viewers who are not always willing to sit through some of the Hollywood commercial cinema which makes up the bulk of the studio releases. 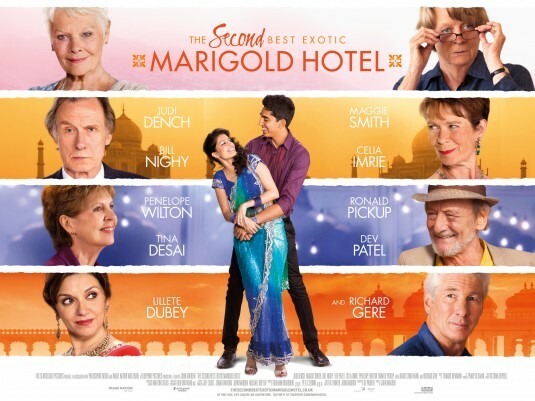 The Second Best Marigold Hotel is recommended viewing for those that enjoyed the first film, and similar movies like Enchanted April, Tea with Mussolini and Ladies in Lavender.